9-year-old Hassan Dallal. Image via Getty. The boy’s agony, coupled with his desperation and panic, has run through my mind since I watched the video about a month ago after it was shared on social media by a Washington Post reporter. I cannot forget the panic on his dusty face, the small collar poking out from his sweater, his familiar childish demand (“carry me”) cried with such desperation and in the midst of such chaos. It is hard to convey the intensity of the video—hard to capture the boy’s panic; hard to capture his father’s helplessness—without resorting to cliches. Words fail to capture the reality of such moments. To say that the video is horrific or heartbreaking inserts a certain greeting card mawkishness into a visceral, bloody moment. Where words cease, however, the image lingers. The boy is named Abdel Basit Al-Satouf. Ten days after his home was bombed, he was transferred to a hospital in Turkey where he continues to physically recover from his injuries. The image of Abdel did not “go viral” like so many other images of injured or dead Syrian children. Perhaps it was too graphic. Indeed, in the handful of posts about Abdel and the bombing of Idlib, the video is preceded by warnings and autoplay is turned off (in some, a still simply shows Abdel’s face with white blurs censoring his bloody injuries). Or perhaps it did not have the saintly, meditative quality that virality often demands; perhaps Abdel’s cries for help were too vocal, too resistant to the easy narrative often imposed on photographs. Silence, perhaps, is less painful to process. Abdel is just one of the numerous children whose suffering we believe we have witnessed; one of many images that have accumulated since the war in Syria began. There are hundreds, perhaps thousands, of similar images; of photographs of Syrian children in pain, suffering the loss of family or limbs or even life. Such photographs are often described as “powerful” and, indeed, it is hard to deny that they are. Such photographs, John Berger wrote in “Photographs of Agony,” are “arresting,” they demand prolonged attention. But where agony intersects with power is a mess of contradictions. The images of Abdel seem to demand a response but they cannot say what that response should be; the images resist answers. Even so, such photographs were offered as evidence, as proof of the need for American force earlier this month. The Trump White House, citing the President’s shock at seeing photographs of the “beautiful... kids,” who were killed or injured during a deadly sarin attack in Khan Sheikhun, turned photographs of agony into a weapon. The photograph of Daqneesh exists in a single frame that tells a singular story, cemented in time by the camera. Images—lives and histories—move outside of the frame but they remain unseen or, at least, unrecorded by a camera’s lens or unpublished in newspapers. The photograph of Daqneesh shows the aftermath of the destruction of the apartment building he lived in with his parents and his siblings but it does not show his reunification with his parents that followed or the death of his 10-year-old brother, Ali. Neither does it show the deaths of five other children who lived in Daqneesh’s apartment complex, the loss of his playmates and neighbors. There are photographs of the destruction of Aleppo, maybe even one or two of the Daqneesh family’s building. We witness the war in temporally disparate, unrelated frames unbound by the lineage of events experienced by those in the photograph. We believe that we have experienced the agony that we’ve witnessed in the photograph but, of course, we have not. We have only experienced our own indignation. Photographs of injured children evoke empathy (children, culturally and politically innocent, always do) but that empathy is warped through the very transformation of a child into an image, into an icon. Stuck in time, Daqneesh will always be sitting in the back of an ambulance, his dazed expression will always reflect our own shock back to us. The photograph of Daqneesh has been compared to that of Alan Kurdi, a toddler who drowned off the Turkish coast in 2015 while trying to escape Syria, even though that comparison is not quite right. Like Daqneesh, the photograph of Kurdi offers a viewer a handful of illusions: the boy lies on his stomach, his knees tucked underneath his small body as so many toddlers do as they sleep. In the photograph, Kurdi looks serene. His death in the water, as well as that of most of his family, is erased. Outside of the frame are a series of events unwitnessed by those that mourn over this image: a flight from Syria, an overcrowded boat, and life jackets that didn’t work. What the photographs share is that they are arresting: “We are seized by them,” Berger wrote. Despair takes on some of the other’s suffering to no purpose. Indignation demands action. We try to emerge from the moment of the photograph back into our lives. As we do, the contrast is such that the resumption of our lives appears to be a hopelessly inadequate response to what we have just seen. But the photographs ask nothing. They demand nothing from us other than to look, to look closely at the lives and deaths of the photograph’s subject—to remember every detail, whether or not it is in the photograph: their names, the looks on their faces, folded collars and tiny shoes. The names of the people they love or loved and the naming of the circumstances that led to the photograph. The children in these photographs likely have few thoughts about the geopolitical implications of American indignation. “Those who are there in the situation being photographed, those who hold the hand of the dying or staunch a wound, are not seeing the moment as we have and their responses are of an altogether different order,” Berger wrote. ﻿Trump played the contradictions of the photographs of agony to perfection: exploiting moral outrage. The photograph was weaponized; the agony of children, politicized. Many offered up Alan Kurdi as a visual comparison, a similarly affecting scene, generally failing to note that Trump was not moved by the lifeless boy on the beach or other images of displaced Syrian children. “[I have] absolutely no problem,” with “looking Syrian children in the face,” and telling them that they are unwelcome in America, Trump told a cheering crowd in 2015. “I can look in their face and tell them they can’t come here,” he reiterated. If Trump was aware of photographs like that of Kurdi, then he did not directly reference them; the first time he invoked images of Syria directly was to correlate his decision to dropping bombs. Purposefully or not, Trump played the contradictions of the photographs of agony to perfection: he exploited moral outrage, and he exploited a particularly American sense of righteousness that our indignation is just and correct. The photograph was thus weaponized; the agony of children, politicized. Kurdi’s death, as well as those of his mother Rehana and brother Galib, apparently demanded nothing—or, at least, it didn’t demand anything from Trump. The photographs of the sarin attack in Khan Sheik apparently did. They demanded that the Trump administration redraw the “red line” and half-heartedly commit to a policy of regime change in Syria. They demanded 59 Tomahawk missiles. The photographs, the Trump administration insisted, demanded such policies. “With respect to the disgust that [Trump] had for the imagery that he was seeing and the assessments that his team was providing with respect to the innocent lives, especially the children and babies, that have been killed,” Sean Spicer said in a press conference last week. Meanwhile, Nikki Haley held the photographs up at an emergency meeting of the United Nations Security Council, treated as a kind of obvious reasoning for new American policy. And that sentiment was echoed on television and newspapers where the Trump narrative of the photographs was treated as an obvious and impartial interpretation. There is, of course, no neutral interpretation of photographs; no language to describe them that is not the result of what Berger called a “constructed... total view of reality.” “Hence the necessity of our understanding [photograph as a] weapon which we can use and which can be used against us,” he added. But the photographs, particularly Trump’s employment of them, were instead treated as proof of the necessity of a singular option, as evidence of the ostensibly natural response of military force. These photographs of agony, the coverage implied, could only produce one morally correct response. Take, for example, Ivanka Trump—a mother herself, her brother reminded us—she was “outraged by the images,” and applauded her father’s decision. On CNN, guests were asked about “the power of images to bring us to war.” And at the Times, a sympathetic piece heralded Trump’s “instinct,” describing the decision to bomb Syria as evidence of “an emotional act by a man suddenly aware that the world’s problems were now his—and that turning away, to him, was not an option.” Each report increasingly suggested that Trump’s decision was natural: empathy and violence thus muddled, the White House seemed to insist that the constant production of images of suffering of Syrian children could be ended with aggression. It was either a complete failure of imagination or willful stupidity to believe that Tomahawk missiles wouldn’t produce more photographs of agony, more photographs of maimed and dead Syrian children. Or perhaps it’s a particularly cruel iteration of patriotism that leads us to believe that agony is somehow lessened if we believe its causes are just. 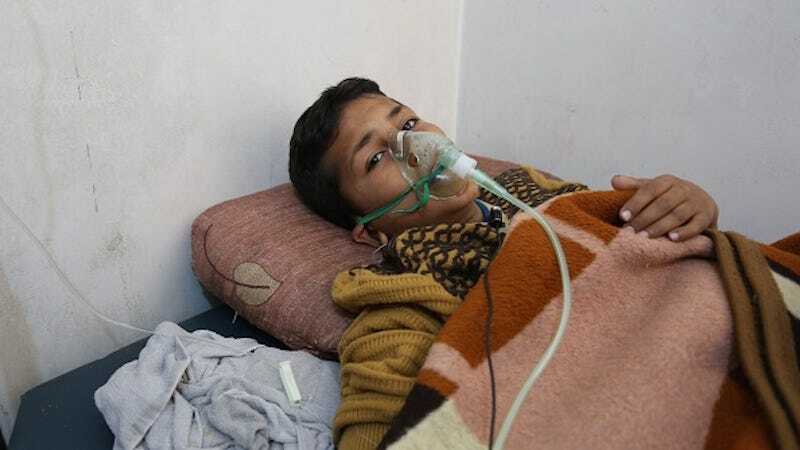 Days before news of the government-ordered sarin attacks in Syria broke, some outlets published photographs of children crying in hospital beds, their heads wrapped with heavy bandages. But those children were in Mosul, the survivors of an accidental airstrike by American-led coalition forces that left almost 300 dead. Those photographs did not “outrage” the President, nor his daughter. The children, apparently, were not beautiful enough. But if the quick cycle of coverage proved one thing, it is that agony, once weaponized, quickly evaporates, disappears as though solved. In less than a week, headlines moved from the “harrowing” and “horrifying” images of the chemical weapons to images more familiar in American visual culture: the nighttime launch of missiles to a location unseen. Those images were, according to one anchor at least, “beautiful,” their sharp modernity a stark contrast to the messiness of their devastation. The agony of other once more weaponized, transformed into a reason for American might, became proof of Trump’s ability to lead, to become a real president. Image via the US Navy/AP. The Trump narrative of the photographs—the administration’s interpretation of the correct response to agony—largely went unchallenged. It is impossible to disagree with the arresting nature of the images, of the shock and destruction that they carry. Instead, there was almost a sense of longing fetishistically encoded in the coverage of the images; an inevitability that their captured inhumanity would lead us to war or to regime change or to military action or whatever bureaucratic label is considered best at this moment. There was another option, of course, another response laid out by Berger, which is to accept the contradictions of such photographs and to “confront our own lack of political freedom.” The photograph, when weaponized, blunts dissent. To disagree with “wars...being for directly or indirectly in ‘our’ name,” is coded as weak or immoral. This is why photographs of agony are so easily weaponized; it’s why Trump was able to humanize the choice to send 59 missiles into Syria. Abdel Basit Al-Satouf—and the others to follow him—will always be treated as almost natural evidence of the necessity of American morality. When Everything Is Surreal, How Do We Process Casual Violence?